Tea sorted in categories by shape. Shape There are 354 products. 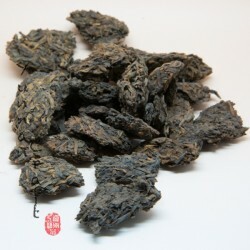 Pressed tea in cakes 4g - 3kg. 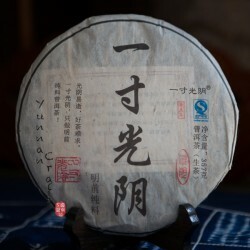 Tuo Cha is compressed tea in the shape of mushroom. Pressed tea into the brick shape. Other shapes of tea , like pellets "cha tou" , small tea balls or tea in tangerine. 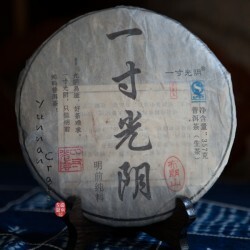 Spring tea leafs from arbor trees in Wu Liang mountain , processed by hand and pressed into medium press tea cake in Qi Li village by local master. 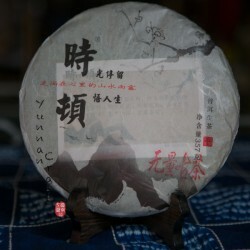 The tea with beautiful scent of flowers has a clear liqueur with touch of fruits giving quite sweet, but slow "hui gan".